Mr. Roy "Lefty" V. Sims, age 84 of Gilbertsville, KY, passed away and is now joyfully walking the streets of gold in Heaven. He was a dedicated husband, father, grandfather, and great-grandfather who loved his family very much. All his life he faithfully served the Lord teaching Sunday School and singing in the choir. Also, he was a founding member of East Marshall Baptist Church in Gilbertsville, KY. Lefty loved fishing and was always on the lake as much as possible. He was a big music lover, UK Wildcat fan, and a bonafide chocoholic. 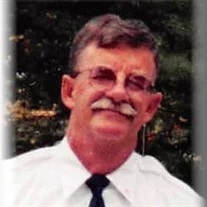 Mr. Sims was a volunteer fireman with the East Marshall Fire Department in Gilbertsville, and later was Department Chaplin. He was retired from Super Valu Foods in Paducah, KY.
Born Friday, July 13, 1934 in Morehead, KY, he was the son of the late Lloyd and Ruhama Sims. Surviving are son, Michael V. Sims, wife Susan of Paducah, KY, daughters, Tina Marie Mason of Benton, KY, Lisa D. Sims of Benton, KY, son-in-law, Carl Vinson of Paducah, KY, grandchildren, Melanie Jarvis of Paducah, KY, Tessa Jamerson of Carthadge, N.C., David James Ray Mason of Atlanta, GA, Adam M. Sims of Paducah, KY, and great-grandchildren, Haylee Nall, Madison Jarvis, Mathew Nall, Reed Jarvis, Aiden Sims, Owen Sims, and Marley Jarvis. He was preceded in death by his parents, wife of 64 years, Helen Frances (Rudd) Sims, daughter, Janet Lee Vinson, 3 brothers and 3 sisters. A Funeral service will be held at 12:00 PM on Saturday, March 23, 2019 at Collier Funeral Chapel located at 211 West 5th St. Benton, KY 42025 with Dr. David Parish officiating. The family will receive friends from 6:00 PM to 8:00 PM on Friday, March 22, 2019, at Collier Funeral Home, 211 West 5th, Benton, KY.
Memorial contributions may be given to the Gideons, Marshall County Camp, PO Box 206, Benton, KY 42025 or the Parkinson's Foundation, 200 SE 1st Street, Suite 800, Miami, Fl 33131.